For years, it has been what is called a 'deteriorating situation'. Now all over South Africa the cities are battlegrounds. The members of the Smales family - liberal whites - are rescued from the terror by their servant, July, who leads them to refuge in his native village. What happens to the Smaleses and to July - the shifts in character and relationships - gives us an unforgettable look into the terrifying, tacit understandings and misunderstandings between blacks and whites. Log In to track Nadine Gordimer on eReaderIQ. 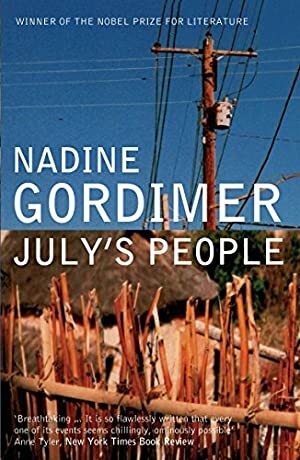 to be notified each time the price drops on any book by Nadine Gordimer. to stop tracking Nadine Gordimer. We started tracking this book on July 14, 2014. This book was £4.12 when we started tracking it. The price of this book has changed 42 times in the past 1,740 days. The current price of this book is £5.66 last checked 4 hours ago. The lowest price to date was £4.12 last reached on July 14, 2014. This book has been £4.12 one time since we started tracking it. The highest price to date was £6.99 last reached on December 29, 2017. We last verified the price of this book about 4 hours ago. At that time, the price was £5.66. This price is subject to change. The price displayed on the Amazon.co.uk website at the time of purchase is the price you will pay for this book. Please confirm the price before making any purchases.